This week's review is on an item odds are many of my 12 regular readers already have. After being a bit frustrated with my search for something to review (I have a few items already selected, but they need more hands-on time before I'll be comfortable reviewing them) I started searching for some 1st Edition material...because I was in a 1e kind of mood. For some reason DTRPG will let you do a search on "1e AD&D", but they also tack on "Official D&D" and "Dungeons & Dragons". Removing either of these other tags simply scraps the whole search. It is all or nothing I guess. So here I am wanting to review some 1e material and I'm being forced to only look at TSR stuff....screw that noise. I know I have something that feels appropriate and isn't TSR material- my handy dandy D30 GM (er...DM) Companion. Now I've already reviewed the D30 Sandbox Companion, and I'm a huge fan of the d30, so I might be a bit biased. I'm hoping that doesn't show too much on this review. The D30 DM Companion is a 40 page PDF is only 3.38 MB. These stats don't mesh with the info from the product page, but I'm counting all the pages (including covers) and the size it is on my hard drive. The PDF is letter-sized, watermarked and secured. Now I know I'm often none-too-happy about PDF security, but usually only when the product is over-secured so it isn't as usable as it should be. The security here isn't, so no big deal. Right off the bat I'm impressed because Richard LeBlanc Jr, the man behind New Big Dragon Games Unlimited and this product, went through the trouble of making the PDF not only bookmarked, but internally hyperlinked as well. Personally I'd probably use this PDF more on my tablet than printed out and having these two things squared away makes all the difference in the world. Since this PDF is all about the d30 tables I love the fact that there is a page devoted on how to use the tables. This is a great touch and frankly it is needed. A lot of the tables are a bit visually confusing and this guide helps out a bit. Unlike the D30 Sandbox Companion, the tables in the D30 DM Companion don't seem to be necessary for the most part. Most of them seem to be embellishments or additions to the tables you'd already have in your game manuals. I think the DM will use these tables because they want to, not because they need to. For me this is an important distinction. For example, the room traps generator on page 12 doesn't tell you when the room is trapped, relying on either the regular game rules or the DM's whim. Not a big deal, but it points out the difference between essential and embellishment. Because some of the tables are a bit visually confusing and the appearance that these tables serve to augment already established tables/rules, the DM wishing to use the D30 DM Companion really needs to take the time to read and re-read these tables before deciding to use them in the game. I'd say about half (to two-thirds) of the tables could easily be used when planning/creating a game session and the other portion, notably the monsters section, would more likely be used during the session. 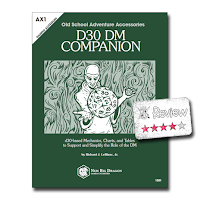 Overall I really like the D30 DM Companion and I think it will add a lot to a game session as long as the DM is smart about its use (which could be said about any DM-centric product). You don't need this product, but if you've been DMing for a while and you enjoy the d30....you will definitely want this product.